6 Outdated Recruitment Practices We Need to Retire - Send and Receive Automated Call and SMS Text Campaigns. The state of recruitment has shifted to a more candidate-centric process, one that makes the experience clear-cut for them without making it complicated for the employer. Despite the advances in technology though, some recruiters still subscribed to somewhat outdated practices and haven’t fully embraced the new norms like recruitment online. At one point, you’ve probably had walk-in applicants to your company and chances are, many employees—including yourself—made questionable glances to these applicants. That’s understandable, though, especially now that email, text, or social media correspondence are preferred. We don’t live in a world that’s scarce in phone and internet lines anymore, so it’s more economical time- and budget-wise to apply online or through a phone call or SMS. Boilerplate or reusable job descriptions can make the process faster and easier, but the results may not be as effective as they could be. Some applicants may see these descriptions and assume that the company is either clueless as to what the job entails, or its managers cannot be bothered to double-check the details. Naturally, these are big turn-offs for applicants. Make job descriptions more engaging by explaining what the new hire have to accomplish. This way, you also attract the right people and set their expectations. You can also give it a personality that reflects the company as a brand. Much like walk-in applications, in-person interviews are done because there was no other way to meet and assess an applicant back then. But now that you have the technology, leverage it to narrow down your choices to filter out those you don’t deem fit. Some of the things you can do are a phone, video, or online chat interview, or sending out screening questions and skills tests through email. By doing these, you’re not making it hard for both the applicant and interviewer. There’s virtually no cost from travel for the job seeker and more time for other tasks for the employer. Job advertisements were put on published materials like newspapers, magazines, or journals because it used to be the most widely-read medium. In addition, niche sectors looking for niche roles find it easier to search and hire applicants when they advertise on relevant or specialized publications. Now that you have websites, online job boards, and social media, there are more ways to reach a broad and niche market to find the right candidates. Unlike buying spots on publications, posting your job openings on Facebook is more cost-effective. Going paperless is just the way it should be today not only because an automated applicant tracking system is a lot easier to use and manage, but also because cutting your paper use is better for the environment. Paperwork can get out of hand once the number of applicants and employees grow, and you can save your company budget in the long run. 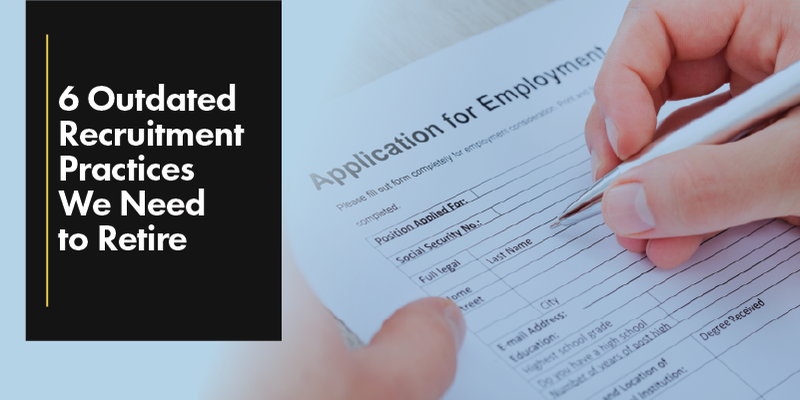 Going through a temporary employment agency to fill positions in your company can be expensive, and most workers acquired through it only stay for a time. With online resources, recruiters can source candidates themselves, and they can assure the quality of their hires. These traditional recruitment methods are not as prominent today due to high costs, low ROI, and even the quality of workers. Candidates, themselves, expect recruiters to be more flexible. New technologies and social media have made their job easier, but they still need more knowledge about it. Ditch these old practices by integrating technology into your recruitment tools but keep your eyes open for the next innovation.